We have developed DXAdvanced DX1000/DX2000 which has substantially strengthened the basic performance and features of the DAQSTATION DX series. DXAdvanced has realized multiple channels and increased measurement interval speed, with DX1000 having up to 12 measurement channels and DX2000 having up to 48 measurement channels. If connecting to an external DAQMASTER MX100 Series unit or the like, DX2000 has a maximum measurement capacity of 348 CH with 1 sec being the shortest measurement interval. In addition to the reinforcements made to the basic performance with display variations, network features, increased memory capacity and so on, the new DXAdvanced is housed in a drop-proof structure that protects it from dust. This paper outlines the strengthened measurement capabilities, the display variations, the increased memory capacity, the network and so on, and introduces the PC software. 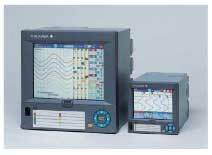 Yokogawa Electric Corporation, one of the leading manufacturers of industrial recorders, put the DAQSTATION DX series stations on the market in 1999, which added information processing and transmission functions to conventional recorders. Since then, Yokogawa has developed the CX series incorporating control functions, and the DX-P series incorporating enhanced security functions and conforming to 21CFR Part 11 in order to respond to diversifying field needs. These products have been very well received in the market. This time around, Yokogawa has developed the DXAdvanced series DX1000 and DX2000, which replace the conventional DX100/200 series as successor models and provide substantially enhanced measurement, display, memory, and networking functions and performance in order to respond to market needs. Figure 1 shows their external view of the DX1000 and DX2000. The DXAdvanced series is designed as a next-generation data acquisition station, which incorporates advanced networking functions, a wide variety of display functions, and sophisticated information processing functions. Table 1 shows the maximum number of measurement channels and the shortest measurement intervals. The number of measurement channels has been increased to up to 1.6 times that of conventional recorders, and the measurement interval has been decreased to one-fifth to one-eighth that ofconventional recorders. In addition, connecting the DX2000 series to external input units such as DAQMASTER MW100 series units enables analog measurements on up to 348 channels (with the shortest interval of 1 second) to be made (Figure 2). UBS keyboards and infrared remote control units are supported, which makes text input and configuration quick and easy. A wide variety of display screens have been inherited and operability has been improved by adding unique functions such as a function to customize the operation menu that tends to become complicated due to sophisticated functions, and a function to jump to a preset operating display screen by just touching the button. Compact flash cards up to 200 MB (approximately 170 times the conventional memory) have been made possible to be mounted as the internal memory for long-time recording of measured data on multiple channels. In addition to a highly reliable compact flash card (1 GB), USB memory is supported as external media for enabling a large amount of data to be recorded and offline data to be transferred to a PC. An Ethernet interface is provided as standard. Conventional functions such as FTP data file transfer, Web browser based simplified monitoring, and sending E-mail were inherited, while new functions such as time setting (SNTP) and automatic network configuration (DHCP) were added. In addition, the Modbus/TCP protocol allows for the DX2000 to acquire data at multiple points in conjunction with external input units such as the MX100 series. Conventional RS-232 and RS-422-A/485 communication interfaces are also supported. The dust- and drip-proof structure of the front panel designed in compliance with the IEC529-IP65 standard and the sealed structure of the casing on the backside of the unit allow for the use under harsh environments. The log-in function and the key-lock function installed in the unit prevent unauthorized persons from accessing the unit, and the locking mechanism installed for the front door latch, which requires a special key, prevents any person from mistakenly touching the power switch or accessing the external media. In addition to the above, the use of a temperature- compensated clock IC achieved a clock accuracy of ± 10 ppm (approximately one-tenth of the conventional accuracy). As a sister model of the DX1000, the DX1000N is available. Its internal chassis is designed to be drawn out of the casing to facilitate maintenance such as periodic calibration after wiring, or regular maintenance (Figure 3). In the DXAdvanced station, the functions became sophisticated from those in the existing series, and the manufacturing cost was reduced by reviewing each of the electrical and electronic circuits compared with the existing models. Figure 4 shows the hardware configuration of the DXAdvanced station. The input measuring section incorporates well-proven, in- house developed Signal Conditioner Chips (SCC's), and this achieved integration of circuits, increased reliability, and reduced power consumption. In addition, the SCC itself switches scanners (SSR) according to a measurement channel and switches measurement circuits according to a setting range in real time, thus higher-speed measurement became possible. Figure 5 shows the block diagram of the SCC. Two types of measuring section are available. One supports up to 12 channels with 1 A/D and is capable of the maximum speed of 125 ms, and the other supports 2 channels with 1 A/D and is capable of measurement at the maximum speed of 25 ms. 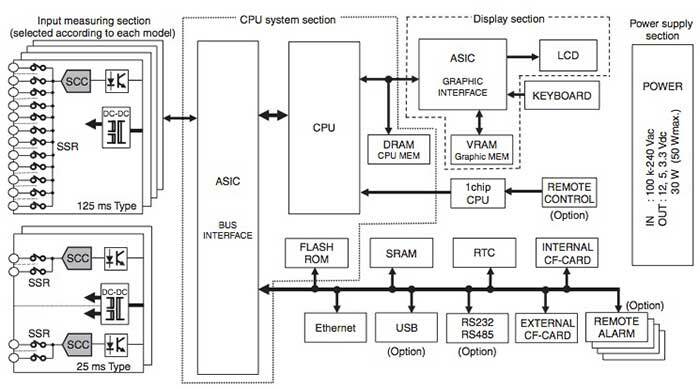 The CPU system section incorporates a high speed 32-bit RISC CPU (180-MHz operating frequency). When the power is turned on, the CPU program within the Flash ROM isloaded to DRAM on the CPU and started by the boot program. 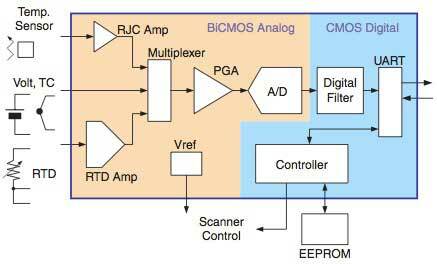 The CPU is connected to each dedicated control IC for USB and Ethernet communications, to SRAM that serves as the primary buffer for configuration information and measured data, and to internal and external memory for saving data (CF-CARD), via the bus interface ASIC. The input measuring section (SCC) and serial signals from the real time clock (RTC IC) used for the purpose of clock are also connected via the ASIC in the same manner. 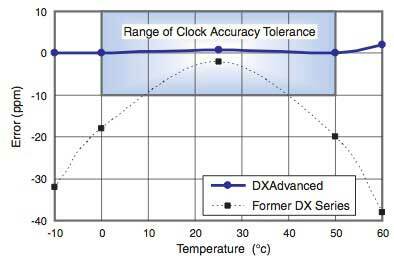 The use of a temperature-compensated crystal oscillator in the real time clock (RTC) has improved the absolute time accuracy for recording data (Figure 6). The power supply section that used to use a power supply purchased from a third party has been newly designed in- house. As a result, the degree of design freedom for heat dissipation in the sealed enclosure was increased and the service life of the component having a recommended replacement interval (electrolytic capacitor) was extended, and components needed to suppress an increase of heat were simplified. Thus, it became possible to use the identical power supply section both in the DX1000 and DX2000. The DX1000 uses a 5.5-inch and the DX2000 a 10.4-inch wide view TFT color LCD display respectively. A new component layout and architectural redesign for the sealed enclosure reduced the influence on the reference junction compensation error, which is a problem in multipoint temperature measurements using thermocouples. In addition, the use of an aluminum plate in conjunction with a heat conductive sheet disperses heat and suppresses heat build-up in the CPU, which is expected to occur due to an increase in the CPU utilization as a result of sophistication of functions. The series comply with a number of overseas standards such as CE marks, CSA, UL (NRTL/C) and acquired the relevant certifications. Furthermore, the series pays attention to environmental design and employs gold plating in printed circuit boards in preparation for global environmental laws and rules, which may have to be addressed in the future. A panel- mounted instrument is usually fixed using the clamping fixtures after it is inserted through the panel hole from the front. Then, wires are connected to the terminals on the backside of the instrument before it is used. Therefore, whenever regular calibration is carried out, wires must be disconnected on the backside of the instrument before the instrument is taken out for calibration. To simplify regular calibration, the internal chassis drawing-out model DX1000N has been developed based on the DX1000. The DX1000N is designed such that the internal chassis, which comprises an A/D circuit section, power supply section, CPU circuit section and display section, all relating to calibration, can be taken out of the front panel without disconnecting terminal wiring on the backside of the instrument. A compact flash (CF) card was adopted as the internal memory to allow for recording data on more channels for a longer time. The CF card has error check and correction (ECC) and access equalization processing functions for the purpose of increasing reliability. The CF card is internally divided into two segments, for saving data and saving files depending on the usage. The data saving segment is used to save data such as measured data that are currently being sampled, as well as alarm and message data. Fixed size files are available for each type of data to increase efficiency in save-processing. The data saving segment employs SRAM as the primary buffer (Figure 4) to buffer a certain amount of data before writing it to the segment, in order to reduce the write frequency and increase the durability of the CF card, which has a limited service life of writing. The file saving segment is used to save various types of data held in the data saving segment as data files that are created over a certain period of time. Data can be output to the outside without data conversion because the data are saved in the internal memory as files. Furthermore, the file saving segment uses a ring buffer to process files, so a particular file can be loaded to the external storage media any number of times, unless the file is overwritten. The CF card used as the internal memory is controlled by the File Allocation Table (FAT) filing system. A FAT segment is available in SRAM (Figure 4) and a journaling function was installed to prevent the file system from breaking down in a power failure. Thus, after power recovers, data can be restored using the FAT data and operating history data that were recorded before the power failure occurred, and the consistency of the file system can be maintained. Provision of a Kanji (Chinese characters) input function allows for inputting Kanji and Hiragana (JIS first level only) for messages and tag names. Kanji input is accomplished by converting a clause string of input single-byte kana characters and selecting appropriate kanji characters. In addition, a Chinese input function is available for the Chinese market. The function converts tone 'pinyin'- characters into written Chinese language. The Chinese input function was developed by a development team in the People's Republic of China, which was representative for all the development work from the specification of input system to design, coding, and evaluation. DAQSTANDARD for DXAdvanced is PC software that comes standard with the DXAdvanced series, and that provides a function that allows users to easily configure the settings. The configuration software also supports the settings of the existing DX100/DX200 series. 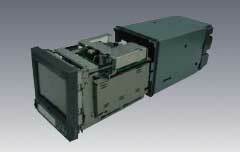 In addition, Operability of the display screens of the DX100 and DX200 series have been inherited. Arithmetic expression input can be accomplished by just selecting function names and channels using the mouse. This paper outlines the distinguished functions of the DXAdvanced DX1000 and DX2000, and hardware, firmware and PC software that are needed for those functions. We are convinced that the DX1000 and DX2000 with substantially enhanced functions will be able to play a central role in the market of small- scale instrumentation systems. We would like to pay attention to changes in the market and continue developing products that can respond to a wide range of user needs in the future. DAQSTATION', 'DXAdvanced', and 'DAQMASTER' are registered trademarks of Yokogawa Electric Corporation. In addition, product names, software names and other names that appear in this document are trademarks or registered trademarks of their respective company or organized body.